Marrakech also known at Marrakesh is one of the most cosmpopolitan cities in Morocco. The name Marrakech originates from the Amazigh (Berber) words mur (n) akush, which means “Land of God.” It is the third largest city in Morocco, after Casablanca and Rabat, and lies near the foothills of the snow-capped Atlas Mountains. It is a few hours from the foot of the Sahara Desert. Its location and contrasting landscape has made it an enviable destination in Morocco plus the perfect city to utilize as a based for discovering cities outside Marrakech. The Top 5 tours from Marrakech offer a Morocco Traveler a brief get away from the bustling medina. 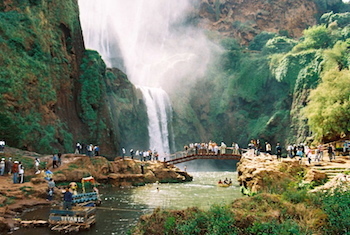 Cascades D’Ouzoud Waterfalls – Discover Waterfalls, Swim and Enjoy Lunch in a Traditional Berber Village. Located in a lush valley, in a friendly Berber village are the three beautiful tiered waterfalls of Ouzoud dropping 110m into the river below. Take a hike along the river up to the caves and gorges of Oued el-Abid, or stay close by the falls and enjoy the natural scenery. In the summer time, enjoy a picnic and mingle with Marrakshis that frequent this peaceful area on the weekends.Enjoy a local riverboat as you cruise across the river. This is our Top Tour from Marrakech selected for adventure travelers who want a combination of hiking, swimming and village exploration. 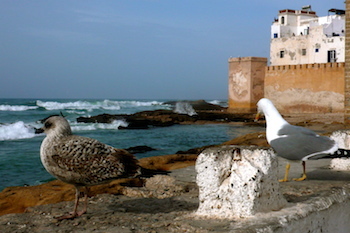 Essaouira Coastal Tour – Journey and Discover the seaside resort town of Essaouira on this One Day Tour from Marrakesh. En route enjoy lunch at a local fromagerie and wine tasting at one of Morocco’s leading wineries in the Valley of Essaouira. Explore the thuya wood workers, the artisans boutiques, old Portuguese Ramparts and charming medina in Essaouira. End the day dining on fresh fish at the port or a local restaurant such as Umia or One-Up, Essaouira’s chicest eats. This is our Top Tour from Marrakech selected for foodies and those who want a laid back excursion in a small coastal town. High Atlas Mountains Tour – Journey and discover Imlil Village & High Atlas Toubkal on this One Day Tour from Marrakesh. En route stop at a Berber home for tea and bread, followed by a visit to a traditional village and farm. Explore a local souk and hike in the Toubkal mountain region, the second highest next to Kilamnajaro. Enjoy lunch at Richard Branson’s Kasbah Tamadot or at a local hideaway, Kasbah Toubkal that boasts majestic views of the High Atlas. This is our Top Tour from Marrakech selected for active travelers who want a combination of adventure and exploration of local culture. Ourika Valley Tour – Discover the Ourika Valley on this One Day Tour from Marrakesh. Moving through the valley you will visit Setti Fatma’s Waterfalls, a favorite weekend resort of many Moroccans appreciated for its beautiful streams and waterfalls. Enjoy views of high green terraces, Atlas peaks, villages in the rocky foothills from the seven waterfalls that surround the village. Trek along the pretty trails and, climb the walls to see rock carvings. Lunch near the Setti Fatma Cascades in a traditional Moroccan restaurant, or have a picnic. This is our Top Tour from Marrakech selected for active travelers who want a combination of adventure and exploration through Berber Villages. Ourigane Valley Tour – Discover the Berber Valley of Ourigane, the Tinmel Mosque and charming villages on this One Day Tour from Marrakech. 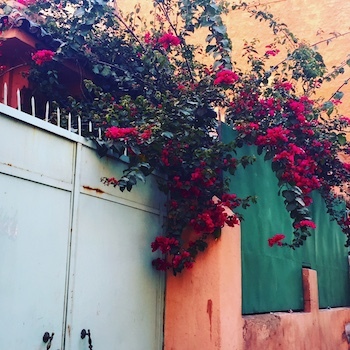 Nestled in the tranquil foothills of the High Atlas Mountains in the heart of the Toubkal National Park is the charming and quaint Berber village region of Ourigane. Ourigane boasts magnificent views of the High Atlas range along with out door activities ranging from hiking, walking, horse-riding and mountain biking. A wide variety of birdlife awaits you. Located on the valley floor of the Oued ‘River’ Nfis, Ourigane is situated 1,000 meters above sea level. Visit the Tinmel Mosque and if time allows the ancient Jewish Zaouia. Travel Exploration specializes in Morocco Travel. We provide Tours and travel opportunities to Morocco for the independent traveler and tailor-made tours for families and groups with a distinctly unique flavor. From Morocco’s Seven Imperial Cities, to the Magical Sahara Travel Exploration offers a captivating experience that will inspire you. At Travel Exploration we guarantee that you will discover the best of Morocco! Call Travel Exploration at 1 (800) 787-8806 or + 1 (212) 618882681 and let’s book a tour to Morocco for you today.